As my trip to Iceland was approaching, I was getting increasingly more worried. Not only had my holiday in Hong Kong been cancelled because of the volcanic eruption in Iceland – the country’s main gateway to the outside world, Keflavik airport, also remained closed for about a week. I even took up a habit of starting my day by checking the following websites, in that order: (a) Meteorological Office of Iceland’s nation-wide wind direction forecast, (b) the UK Met Office’s regular updates on the spread of volcanic ashes and (c) naturally, flash news by Icelandair and Keflavik airport per se. Clearly not everybody’s first choice of a daily media round-up, but I got so used to it that I might still be running it for a while upon my return to London. 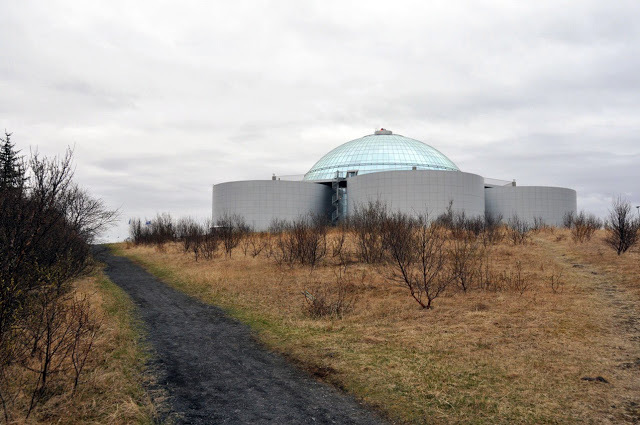 I had eventually given up all hope of reaching Iceland – when, just a day before my flight, the Keflavik airport fully re-opened and all flights had resumed. After two weeks of uncertainty, I could barely believe my luck. At that point, I had spent close to four weeks without leaving the UK and was experiencing withdrawal symptoms of indescribable strength. A plane passing overhead would almost make me cry, as did minor airport mentions in the news. Playing the cabin crew’s safety demonstration in my head over and over again, I felt like I was going slightly mad. I was longing for the skies. But it was worth waiting for the magic moment of re-entering Heathrow – checking in for my flight, drinking coffee in the departures hall, following the announcement screens and hurrying through the terminal building towards my gate. All the magic moments of air travel. The moments I had greatly missed. The queue for the Icelandair flight to Reykjavik couldn’t have been more homogenously Icelandic. After seeing my colleagues raise their eyebrows repeatedly when hearing about my plans to visit Iceland, this was hardly a surprise. Iceland is not enjoying its heyday popularity in the UK these days and is, rather erroneously, often considered dangerous because of that notorious volcanic activity. I didn’t mind mingling with the cheerful Icelanders. Breaking the stereotype of Nordic people being “quiet”, those were chattering away happily, all at once. Perhaps, given the country’s population of barely over 300,000 people, they all knew each other – or were related or something. What a brave bunch, I kept thinking – populating a piece of land that is basically half-volcano and half-glacier, and looking jolly optimistic at that. The flight to Keflavik was pure bliss for a travel-deprived globetrotter like me. Twilight was building up mysteriously around us, but the horizon ahead never quite lost its golden coating – the sign that we were narrowly following the sunset. At some point, the captain pointed out the scarlet glow of Eyjafjallajökull’s eruption below. In the clouded up night sky, it made a magnificent contrast. That is how I will always remember Iceland – the country of the eternal sunset and glowing volcanoes. I was blessed to be sitting next to the most extravagant elderly Icelandic lady I could hope for. 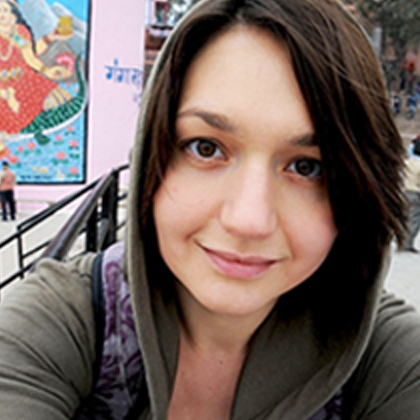 Let’s call her Elin; with barely any daylight during a typical Icelandic winter, Elin prefers to spend six months every year in India instead. I caught her just returning home. She looked every bit Icelandic, but dressed in line with Hindu traditions. An unforgettable sight – and a wonderful source of Iceland-related gossip, too. For example, I was told the country was americanised to a great extent. That, under the “Icesave”, they were supposed to send “[c]ash” to the UK but realised there was no letter “c” in the Icelandic alphabet (which I thought was outrageously cheeky). That Icelandic children were taught Danish language at school. That most Icelanders swear by Protestant work ethic and work religiously at a least three jobs for over 60 hours per week. That the country’s president Ólafur Ragnar Grímsson was flying on the same plane with us. Really? The president of a country was casually sitting on a passenger flight? I refused to believe a word – until, during the exit at arrival, we were held back for a few seconds to allow somebody important pass first. There emerged the President himself, responding to friendly waves from his fellow Icelanders and looking just like on television. Another VIP to add to my modest list of physical encounters. Iceland is a small country, and flying on scheduled routes is probably very much normal for a president. Also, as I later found out, Iceland’s Prime Minister’s telephone number is listed in a public phone book. Personally, I found this fact even more impressive than all the geysers, volcanoes and geothermal springs in that unbelievable little country taken together. Imagine the likes of Berlusconi having their telephone number made available publicly. The arrival worked like clockwork. The passport controller knew exactly where Latvia was; the belt conveyor spat out our luggage within minutes; the Flybus airport transfer company accepted cards as payment; the bus itself was parked a mere step outside the terminal. At some point I even wondered if the president would be joining us on the bus ride to town, too. The euphoria continued at the hotel – wireless internet was free to all and coffee making facilities were duly parked in my room. Small things that matter a lot in life! I was back in the Nordics, the region I love and admire so much. I got up at 7:30am the next morning, ready to hit the exploratory path with an 8.5-hour Golden Circle tour. 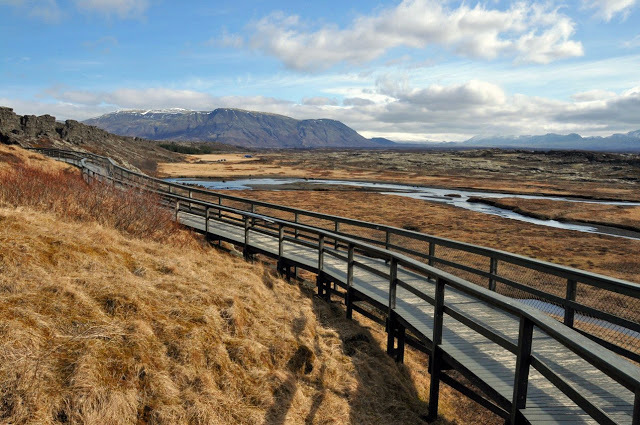 Golden Circle is the name of a popular tourist route in southwest Iceland, offered by every major self-respecting local travel agency. 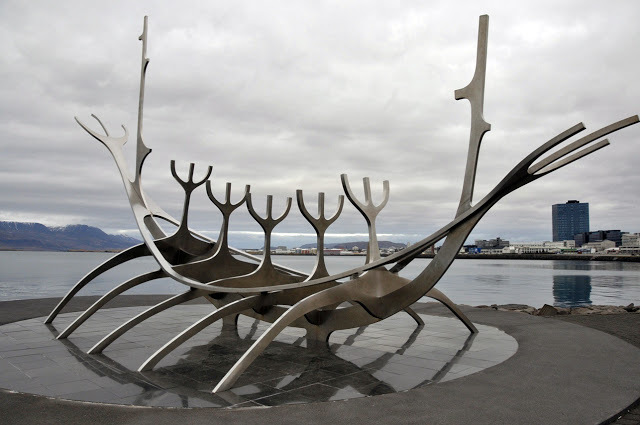 Rather fortunately, the best known and most frequently visited natural wonders of Iceland are within a day tour driving distance (300 km overall) out of the capital, Reykjavik. I am proud to confirm that I was the only Latvian on the bus. The first thing I noticed in addition to a couple of Americans and the same number of Germans was the overwhelming majority of Scandinavian people – probably about 15 out of 20. Nostalgic about my heavily Nordic past and having visited or lived in all of the other four Nordic countries, I welcomed seeing so many representatives of the region again. Not far from me sat a particularly fine example of Danish handsomeness. Equipped with unforgettable blue eyes and a unique smile, he made me wish I was sitting next to him rather than on my own, and taking photos of his fantastic pair of eyes rather than Icelandic natural wonders. But time came to depart, and it was back to business for anjči. We had a busy morning and afternoon (see Flickr photoset for Golden Circle here). Our first stop was Þingvallavatn Lake (the largest natural lake in Iceland) and Þingvellir National Park (where the world’s first parliament of Alþingi was established in 930). We were sat through an informative video demonstration about the area – Icelanders passionately love their country and won’t miss an opportunity to educate foreigners about it – and enjoyed glorious views over the lake and the valley. 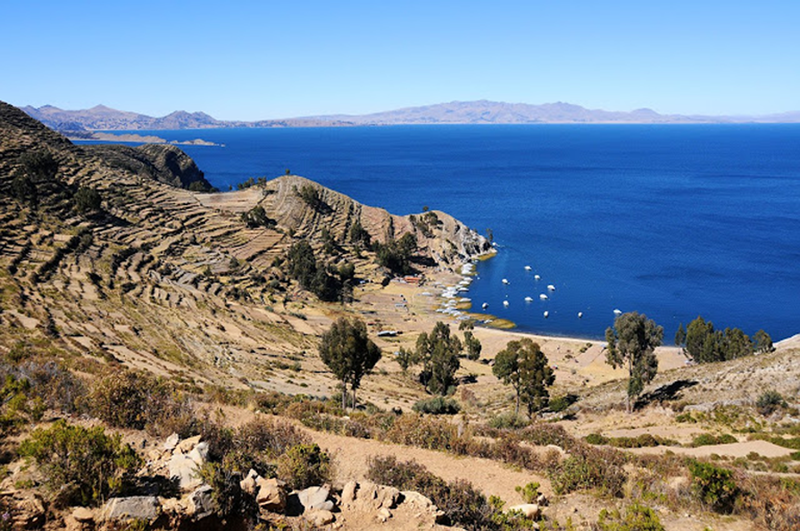 The lake lies over the continental drift between the North American and Eurasian tectonic plates. With the plates drifting apart by a few centimetres a year, Iceland is slowly growing in size. In 60 million years, it will apparently become the largest country in the world! Now that’s what I call a quiet invasion. Sounds like Russia better watch out. Our next stop was Gullfoss, Iceland’s most famous waterfall. Having been warned lovingly by the driver not to fall into the water and “end up in the Atlantic Ocean” because it would cost him “a whole load of paperwork”, we carefully edged towards the viewing points. Not forgetting beforehand to feast on a hearty local speciality of a traditional lamb soup, the kjötsúpa. I am not ashamed to admit I had two portions. 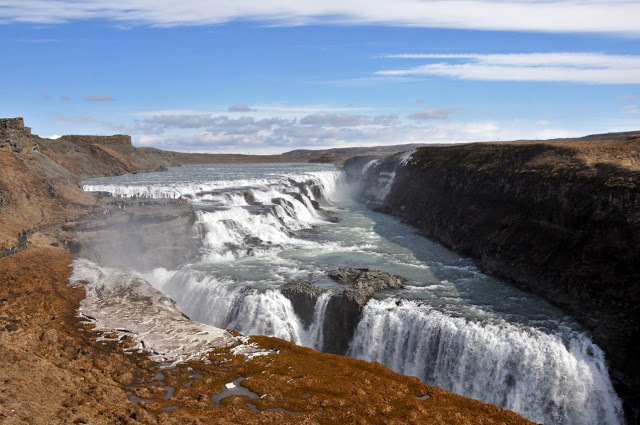 Gullfoss can literally be translated as “Golden falls” and results from Hvítá River plunging down a 32-meter crevice. The breath-taking view is best seen, not described. I am quite a waterfall virgin and had never seen such a mass of water streaming down so furiously towards the ocean. Given that my most marked waterfall experience to date had been the “longest waterfall in Europe”, conveniently located in Kuldiga, Latvia – but, sadly, not even a meter in height – I was stunned. Iceland truly had something to offer. Briefly stopping to stroke a few Icelandic ponies on the way, on we went to Haukadalur, an area of active geysers about 10 km away from Gullfoss. 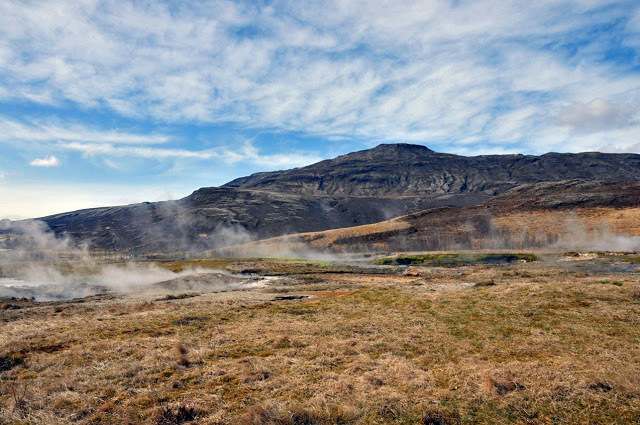 Geysers are natural hot springs that intermittently eject a column of water and vapour into the air and are characteristic to Iceland. 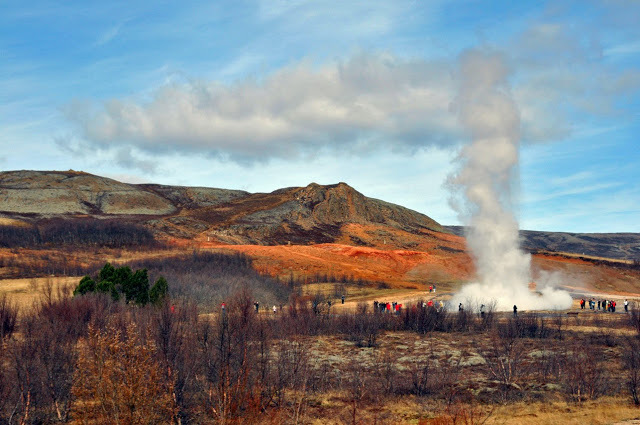 Moreover, a “geyser” is one of the very few examples of global adoption of an originally Icelandic word. Sadly, the namesake Geysir has grown rather quiet these days, activating not more than a couple of times daily – and apparently making the Queen of Denmark once wait the whole day before breaking out. Iceland having been a Danish colony, this sounded rather cheeky. Laughing, I looked at the cute Dane. He was looking at me too, smiling with those sky-coloured Nordic eyes. Oh, the beauty of life. My mission did not include chatting up cute Danish guys, however. I duly climbed the nearest hill, exposed myself to gusty Icelandic winds and stayed on guard for a geyser eruption. The most active one in the area, Strokkur, worked hard to please the audience. It is reported that it erupts every 5-7 minutes, often a couple of times in a row. I had great fun watching the ever-troubled water surface building up slowly towards the breakout. My only problem was coping with the overwhelming smell of sulphur – commonly associated with rotten eggs, it is an unalienable part of every geyser. 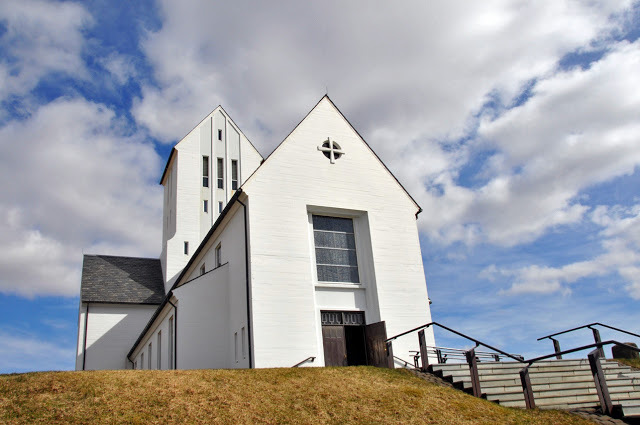 We left Haukadalur safely behind and continued to Skálholt church, one of the largest churches in Iceland and an important historic and religious centre. Some concert preparations were ongoing there. I enjoyed listening to truly angelic singing (who’d tell Icelandic men were such softies at heart!) and a glimpse at Iceland’s most famous volcano (in normal circumstances, at least), Hekla, in the distance. Strangely enough, a former Danish ambassador to Iceland was buried on the church grounds. I wonder what the poor fellow had done – or not done – in his, no doubt, eventful life. We then visited the Hveragerði village famous for its greenhouses naturally heated by volcanic hot springs. Local kids were passing the time boiling eggs in steaming springs and telling stories of people falling into the so-called “Killer Hole” in the ground. The hole looked scary and smelt of sulphur more than sulphur itself. We unanimously voted to retreat. The finishing point of our tour was the Nesjavellir geothermal power plant. Back in my days as an investment banker, I once had to prepare a brief on the Icelandic power market and was therefore keenly interested. Around 80% of Iceland’s energy sources are renewable and composed of geothermal and hydro. 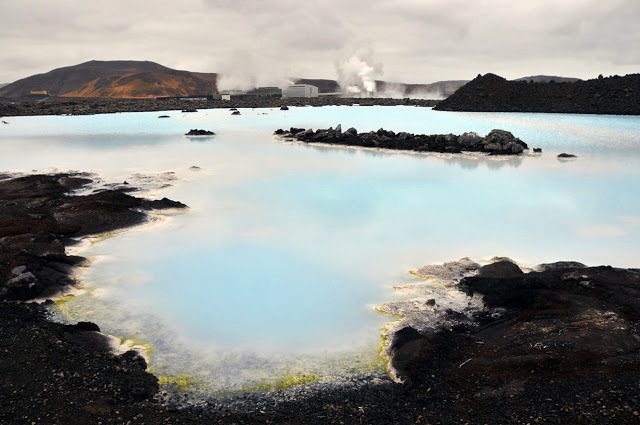 Iceland is among the most geothermally active countries in the world; in fact, the entire city of Reykjavik is heated solely by geothermal springs. Seeing a functioning geothermal plant lost in the steamy haze in the middle of nowhere was truly spectacular. I promised myself to build at least one in a geothermally active area under my employer’s coverage – say, Kamchatka – when I would get back to London. Back in Reykjavik, emotionally heart-broken after parting with my platonic Danish love – and his blue eyes – I desperately needed a distraction. Suddenly I felt inspiration filling up my every vein. 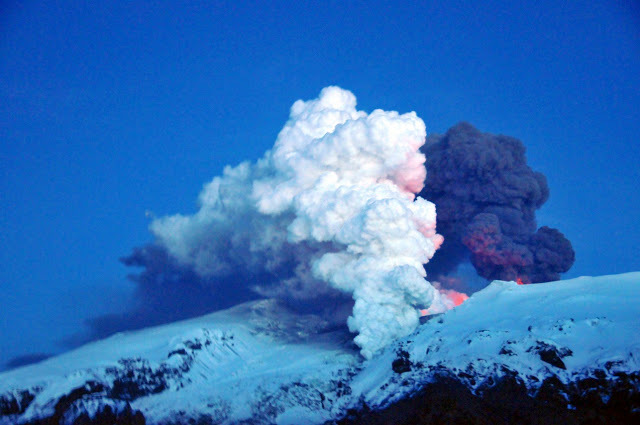 What if I tried to approach Eyjafjallajökull, Iceland’s famously erupting volcano? I heard some companies were offering evening jeep tours. I rushed back to the hotel and got them to call around. Indeed, one place for the night was available. Yippie! After week-long volcano-inflicted aggression – and my utterly Eyjafjallajökull-ed holiday in Hong Kong – I was finally going to face the naughty boy in person. The driver had arrived, and off we went. 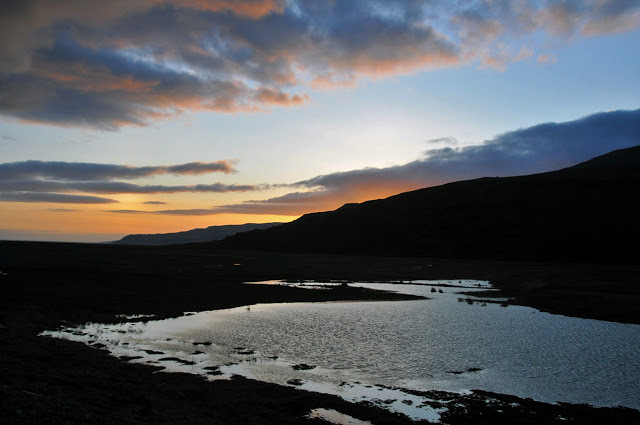 We had been driving along the ring road circling Iceland (in-between mostly lie the aforementioned glaciers and volcanoes) for a couple of hours, in a rather civilised fashion – when the jeep driver suddenly seemed to have lost the plot. “Seatbelts on!” – he yelled and wheeled off-road onto the blend of hardened lava and water streams. My fellow passengers and I were bouncing up and down, left and right, unsure to what extent such experience could be considered enjoyable. But it was. We made several stops on the way before settling at the point from which there was no way further for safety reasons. The weather was absolutely perfect, with close to clear skies (for Iceland, anyway). I photographed one of the best sunsets on my modest memory (view more photos here). Iceland seemed like a true wonder. …And then I finally saw the promised red glow. Intensifying with every minute, it lit up the night skies with a kind of a wild beauty. The view, soon reinforced by the exploding lava, was simply beyond this world. Needless to say that it was worth every penny I had paid for the tour, and lots more. I forgot everything in the world and photographed away (view the full Flickr photo set here). Finally all of us were too frozen to move. The clocks were approaching midnight, and it was time to return to Reykjavik. I collapsed into a coma sleep as soon as I reached the car. With over 16 hours spent on the road, it was a rough day – and one of the best on my memory, too. My final recollection that night was driving through Reykjavik on a jeep at around 2am and getting entertained looks from the partying locals. Surely it was difficult for them to understand why someone would prefer to spend a Saturday night by the side of an active volcano – the country is full of them, anyway – rather than out in a cool bar. Oh well, each to their own. 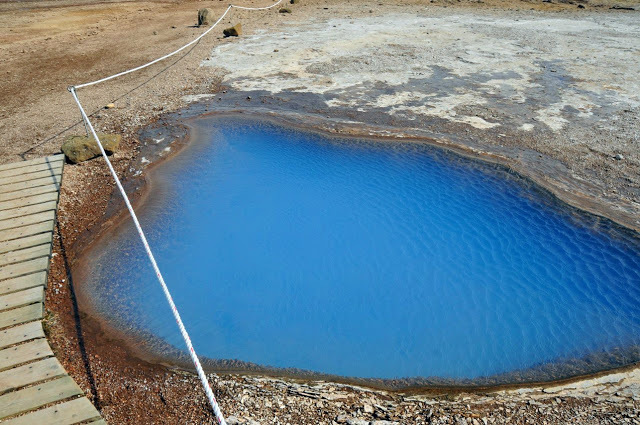 …I was still rather unstable as I got up at 8am the next morning – but the Blue Lagoon visit I had previously planned had to be honoured. The Blue Lagoon (Bláa lónið) is a geothermal spa located in a lava field in Grindavík on the Reykjanes Peninsula, southwestern Iceland. 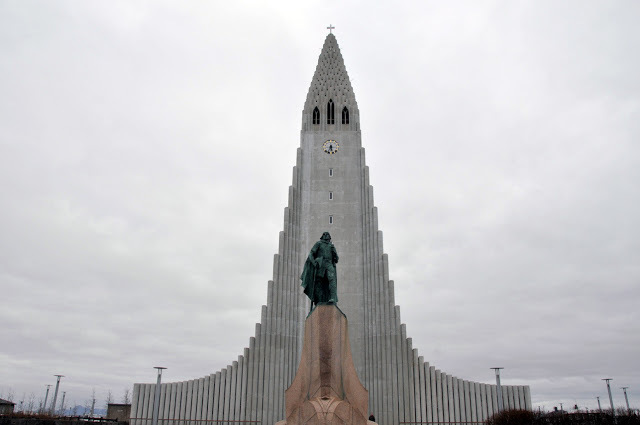 It was officially opened in 1999 and is today firmly written into every tourist’s Icelandic itinerary. My entry into the bus was met by those familiar blue eyes. The cute Dane was going to Blue Lagoon, too? Just as I had managed to get some quality distraction? Madame Destiny was acting a little unfair there, and was best not taken seriously. We exchanged semi-dry “hellos” and left it at that. Barely alive from the previous day’s discovery extravaganza, I spent over five hours soaking around, half-awake, in steaming hot water (see the Flickr photo set here). The experience was blissful beyond words – and beat my previous open-air bath affair at Budapest’s Szechenyi by a long shot. Finally I have found a country which shares my standards for water temperature. The likes of the UK – and especially Greece – have a long way to go. As the spa started filling up with awakening Brits (and the air with their beer-inspired lingo), I decided to return to Reykjavik and dedicate some time to the city itself. With the population of around 120,000 people in the city and 200,000 in the greater area, Reykjavik wasn’t exactly London. Many tourists often choose to overlook it and head straight to the country’s indisputably magnificent natural wonders instead. Nevertheless, fascinated by the idea of a capital city on a northern island in the middle of the Atlantic Ocean, I thought I’d give Reykjavik a chance – and spent about four hours pacing its little streets (Flickr photoset is here). On Sunday evening, the place looked quite empty. Despite an occasional car whooshing by, I couldn’t help thinking I was one of the very few people in Reykjavik that evening. Still, I found the City of “Smokey Bay” (exact translation of Reykjavik, named after the steam rising from its geothermal springs) very charming – and my admiration for the people having chosen to settle there years ago, against all odds, absolutely soared. Finally, I got back to the hotel. My final day in Iceland was coming up – starting early with some morning whale watching. As I tried to buy some hot breakfast the morning after, I came to realise, once again, that Reykjavik was no London. On a Monday morning, no shop seemed to open before 10am. I eventually settled for a chewy chocolate bar from the tiny café on the whale watching boat itself. Reykjavik being an extremely rainy affair, I had been extremely lucky with the weather during the two previous days, with not a slightest sign of rain. On my third day though, the average statistics had been duly confirmed, as it started to drizzle. 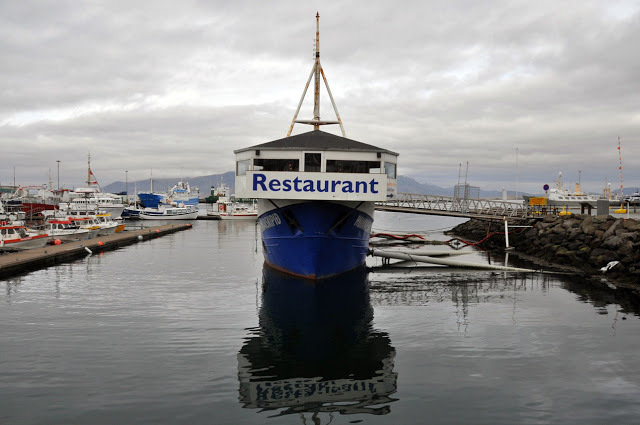 It did not prevent me from boarding one of the whale watching boats in Reykjavik’s Old Harbour and setting off for a sea adventure, however. The blood was warming up in my veins as we sailed into the ocean. I truly felt the daughter of my father – a vocational sailor of over thirty years. 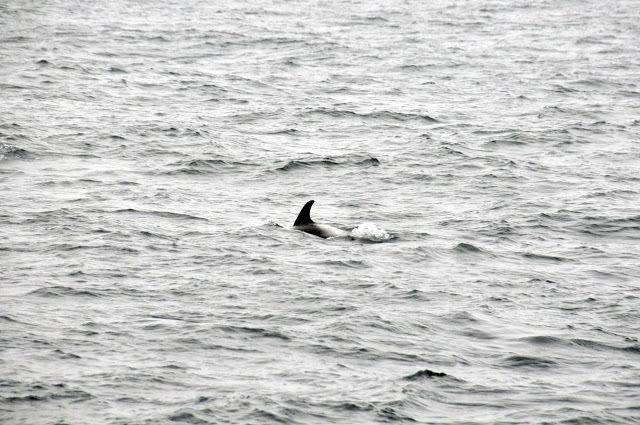 We managed to spot a few smaller whales indigenous to Icelandic waters – and plenty of white dolphins. The dolphins turned out rather playful and curious; some emerged very close to our boat, inducing major excitement among the passengers. Despite not being quick enough for a decent photographic capture, I had a great time (view the Flickr photo set here). Back on the shore, I headed for the airport bus – not forgetting to stop at “Bæjarins beztu pylsur” (“The town’s best hot dog”) – the nation’s most popular hot dog stand and indeed the most frequented local eatery. In 2006, it was titled the best hot dog stand in Europe by the British newspaper The Guardian. The hot dog melted in my mouth. Over my three days in Iceland, I had eaten more hot dogs than during the entire preceding year – and failed to try any of the much appraised Icelandic fish. After all, it is the hot dog that is locally considered to be Iceland’s unofficial “national food”. As much as I hated the idea of leaving, the work back in London wouldn’t wait. With a heavy heart, I watched the proud little island disappearing in the clouds below. I had a fantastic time exploring its amazing wonders during the short three days, and will need to arrange a comeback soon to discover other parts of Iceland and its people. Next time, however, I know what I will do differently. When I am in Iceland next time and come to face a sweet blue-eyed Dane, whether publicly or in private – I will ignore all the geysers, volcanoes and geothermal springs. I will look right through all the waterfalls, greenhouses and glaciers. I won’t stir a limb if the rarest whale in Iceland emerges right in front of my nose and starts singing “Hallelujah”. No, I won’t even care for an offer of ten free hot dogs from “Bæjarins beztu pylsur”. I know what I will do next time. I will aim my camera at those blue Nordic eyes. And I will shoot for victory.